These days even a diagnosis of mild bone loss (osteopenia) is likely to have you walking out your physician’s door with a prescription for a bisphosphonate drug – most likely Fosamax, Actonel or Boniva. As new clinical guidelines around who should be screened for osteoporosis are set to net most of the female US population over the age of 50, bisphosphonate prescriptions are soaring, as vast numbers of healthy individuals are exposed to their effects for better or worse. When it was revealed in 2002 that the harms of hormone replacement therapy (HRT) outweighed the benefits, its demise was the moment bisphosphonate manufacturers had been waiting for. By 2006 Fosamax prescriptions totaled 22 million and annual sales of these drugs reached a staggering US$8.3 billion by 2009. Persuasive advertising, and exaggerated scenarios linking osteoporosis hip fractures to an untimely death easily convinced women to move from one questionable drug therapy to another. But it now seems to be a case of history repeating itself. As the balance of benefit to harm weighs heavily towards serious damage from these drugs, bisphosphonates are well on the way to being shrugged off as another medical mistake of gargantuan proportions. And what about the benefits? Close scrutiny of the evidence indicates that these are drugs that probably don’t prevent fracture at all. Apart from a possible short-term reduction of vertebral height “fractures” determined by x-ray in a very small percentage of high-risk patients, hip fractures are NOT reduced, and may in fact be increased in bisphosphonate users. A large cohort study from Denmark of 16,000 women over 8 years found the incidence of hip fractures was higher in the women taking Fosamax. And a large US trial also found that wrist fractures were higher in the group taking Fosamax. In the long term there is an increased risk of ‘atypical’ (i.e. sudden and spontaneous and slow healing) fractures of the hip and thigh. Given that the potential harms now include jaw osteonecrosis (bone death), pain affecting the bone, joints or muscles, atrial fibrillation, esophageal cancer and spontaneous fracture, some clinicians and researchers are calling for immediate suspension of the use of these drugs. New drugs waiting in the wings like the FDA-approved drug Prolia look set to take over from the bisphosphonates. Prolia has huge potential for harm. And huge potential for profit – predicted to bring in US$2.1 billion by 2012. Sound familiar? 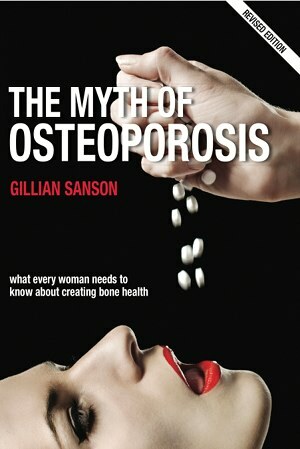 For more on this and all aspects of the osteoporosis industry and on maintaining bone health read my newly revised book The Myth of Osteoporosis. Esophageal cancer, jaw bone necrosis, and giant floating osteoclasts! · A further NEJM article contradicts everything we have been told about the way bisphosphonates work in the body. It now seems they increase rather than decrease osteoclast cell production and that these feral bone-absorbing cells are giant and detached. What this means nobody knows. Hardly stuff to inspire confidence in users! If bisphosphonates offered significant fracture prevention it may be worthwhile debating the benefits and risks. But the majority of the millions of people who take these drugs do not stand to benefit AT ALL. Meanwhile these are toxic compounds that stay in the body. Their mechanics of action are still not understood, and users remain guinea pigs in a massive experiment. A diagnosis of osteoporosis on the basis of a bone density test alone is flawed and close to meaningless. The widespread prescribing of bisphosphonates based on a bone density diagnosis has the ‘worried well’ taking the drug in droves believing they are preventing a disease may never have. The lengthening litany of side-effects: chronic and acute joint bone and muscle pain, sudden serious fractures of the femur, atrial fibrillation, osteonecrosis of the jaw, inflammatory eye disease, and now cancer of the esophagus should have even the most passive of Fosamax , Boniva, Didronel and Actonel users closely questioning their doctors. A National Women’s Health Network article Bone-Breaking Drugs? reports on the sudden increased incidence of unusual and serious fractures of the femur (thigh bone) in women taking Fosamax (alendronate) for more than four years. A Medline search revealing more than 50 reported cases suggests an epidemic of such fractures say the authors Adriane Fugh-Berman and Charlea T. Massion, as reported cases usually tend to be the tip of the iceberg. Reports of serious adverse reactions to bisphosphonate drugs continue to accumulate, indicating they may be doing far more harm than previously thought. Jaw necrosis and other bone necrosis (bone death) is associated with bisphosphonate use and many dentists now won’t work on orthodontic problems in people on bisphosphonates as even without osteonecrosis of the jaw, there is an overall impairment of bone repair mechanisms. Earlier this year the FDA issued an alert regarding chronic and debilitating joint bone and muscle pain. And recently, after examining the evidence the FDA has not been able to confirm that the drugs cause irregular heart rhythms (atrial fibrilliation), but can’t rule it out, either. The FDA says it will do further studies of this issue, but in the meantime it has alerted women about the possible problem. A 2006 literature review published in Drug Safety concluded that the underreporting by US physicians of adverse drug reactions including serious and fatal adverse drug reactions is in excess of 90 percent. Astonishing! If you or someone in your family has experienced a serious reaction to a bisphosphonate drug or any medical product, you can now report directly to the US Food and Drug Administration MedWatch program by going to the MedWatch homepage clicking on “How to Report”, then “Reporting by Health Professionals” or “Reporting by Consumers”. Or you can report your adverse experience directly to the MedWatch Program by calling call 1-800-FDA-1088. There are also consumer websites like http://www.askapatient.com or http://www.topix.com/forum/drug/ where you can read others experiences, ask questions and discuss your concerns. NEWS: Snapping thigh bones caused by bisphosphonates? Hard on the heels of the FDA’s January 2008 alert about serious joint bone and muscle pain associated with the bisphosphonates, comes a worrying series of reports of spontaneous fracturing of the femur (thigh bone) in women who have taken Fosamax for several years. Industry rules at international osteoporosis symposium in D.C.